The United States Geological Survey is still issuing twice daily bulletins on the ongoing situation at Kilauea. Because the volcano is old news (unless, of course, you live anywhere near it) it’s rather slipped out of public view, but Kilauea is still active and making significant and permanent changes to the topography as the Big Island continues to grow. I’ve included two graphics for Kilauea this week. The first is a screen grab from the USGS’s interactive earthquake map and it shows the ongoing seismicity in the area (M2.5 and over). There are so many that it’s difficult to distinguish the five diamond shapes which represent five distinct explosive eruptions at relatively regular intervals over the past week. Most of the data points are circles and represent ‘proper’ earthquakes rather than eruptions and it’s clear that they are strongly focussed around the crater. This map shows lava flows from the current Kilauea eruption. Image by USGS. The second map shows the Kilauea lava flow, and a comparison of the two shows the relationship between them. The eruption of lava from the multiple fissures is at a distance from the crater (so far that it doesn’t appear on the lava flow map), in the eastern Rift Zone, an area where there is little seismicity. The earthquakes indicate the movement of magma away from the chamber to supply the eruptive fissures further away — two different patterns of linked activity. Meanwhile the impacts of the eruption continue, with very small particles of volcanic glass being deposited and areas close to the lava flow, especially near the ocean entry point, continuing to be hazardous, although volcanic gas emission levels have dropped. If I were to ask a random selection of people what the largest volcanic eruption of the 20th century was, I wonder what they’d say? Mt St Helen’s possibly, or Pinatubo? Katla? It was none of these. In fact, last week was the anniversary of the 1912 eruption of Novarupta, in Alaska — and, to my great shame, I had never heard of it. I won’t bore you with the geological details, which are probably only fascinating if you have a particular interest in volcanoes, but the volumes above are big. (Very big.) In today’s context: “This volume is equivalent to 230 years of eruption at Kilauea (Hawaii) or about 30 times the volume erupted by Mount St. Helens (Washington) in 1980”. Alaska does big volcanoes in the same way that it does big earthquakes, and we’d be talking about them a lot more if there were any significant population centres there (though perhaps there’s an element of cause and effect at play here). 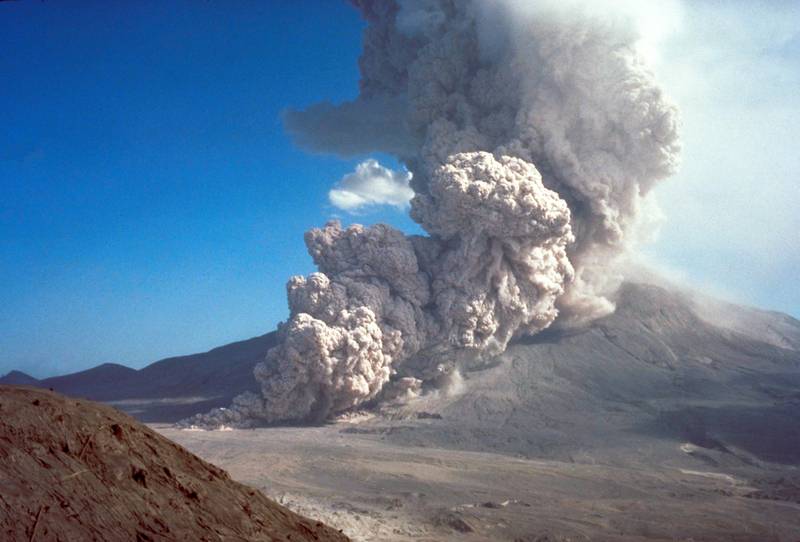 Because of its remoteness, the eruption passed almost unnoticed — and was initially thought to have taken place at a neighbouring volcano, Katmai — and volcanologists didn’t reach the site until four years after the event. I say it went almost unnoticed, but that isn’t strictly true. Though there was sufficient warning to allow the few people who lived near the volcano to leave, there were plenty who saw it from a distance, and there’s a wonderfully evocative paper from the US National Parks service which brings the eyewitness accounts together. If you’re interested in human stories of volcanoes, I heartily recommend it. How Deadly is a Volcano and Why? Pyroclastic flows are the deadliest volcanic hazard. This one is at Mt St Helens. Image by USGS. Another article that caught my eye was one that looked at exactly how volcanoes kill. It came in the wake of the Fuego eruption which I talked about last week, and it was a discussion of a paper reporting on a database of volcanic fatalities and their specific causes. The source paper itself isn’t news (it was published in March, 2017,) but it is interesting if you have the time to read it. The thing that struck me, from a quick read, is that while volcanoes are capable of killing a very large number of people, they don’t kill nearly as many as earthquakes. The largest number of estimated total fatalities in a single eruption was 36,000, at Krakatoa in 1815, whereas an earthquake in China in 1556 killed an estimated 830,000; and the seventh-largest number of fatalities came from Kelut, in Indonesia, in 1919 and was just over 5,000. Another point of interest is that volcanic hazards vary. Over time the most deadly (as we saw with Fuego) have been pyroclastic flows, followed by tsunamis and lahars, but the list of hazards goes on to include such things as lava flows, gas, tephra (ash) and even volcanic lightning. I no longer keep quite as close an eye on earthquakes as I did when I was writing the weekly roundup, but I do check the USGS earthquake map regularly, and I wasn’t the only person to notice (in my case in passing) that things have been pretty quiet. The reply was prompt and helpful. “This is what a random distribution looks like. Longterm average of M6s = ~120/yr. So average 23 days has 8 events. Prob of not having event when rate = 8 is ~1 in 3000. So unusual, but we would expect to see such a gap every ~10 yrs”. I honestly think there could be no clearer and more succinct explanation. Social media takes a lot of criticism, but for me this was a wonderful example of how it can be used in science communication. I was enjoying the article, but was not going to comment on it. Until… until you mentioned the Alaska volcano I’d never even heard of (everyone knows Krakatoa), and when you mentioned the much larger number of deaths caused by earthquakes over volcanoes. Now that I stop and think of it (something many people NEVER do), it makes sense. But I’d never thought of it before.